There's a small restaurant in our neighborhood known for great pizza. And yes, the pizza is on point. But, really, it's their salads I crave - substantial, always changing, made from whatever looks great at the market. I'd tell you the name of the place, but scoring a table is already enough of a wait. It's Ragazza. 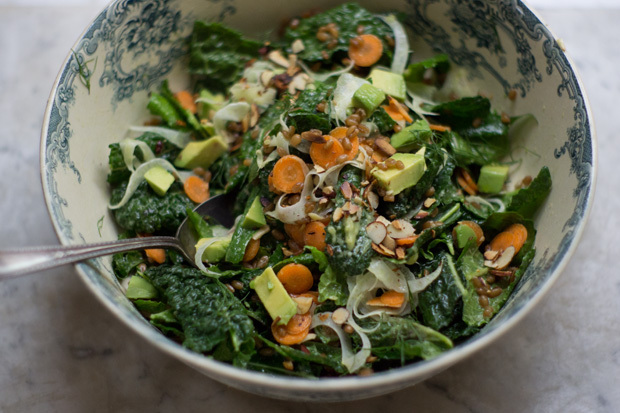 I ordered a ringer of a salad the other night, and have been making a version at home in the days since - kale, farro, lots of avocado, carrots and fennel tossed with a creamy green garlic dressing. It's as good as it sounds. The version I've been making is down below, or you can check out the version Sharon makes with little gem lettuce here (scroll a bit). To prep the fennel and carrots, it's worth using a mandolin if you have one. If not, no problem, just use a knife an slice very thinly. If you do too crude a cut the salad loses a bit of its finesse. I like it made with semi-pearled farro, but when I ran out of that reached for wheatberries too. Either way is good. It has been a bit wild around here and this sort of thing is nice to be able to throw together on somewhat of a whim. To keep most of the ingredients prepped isn't a big deal (grains/dressing/carrots/ nuts)...then, it's not much of a leap to a full meal by adding a poached egg. Lacinato kale is my variety of choice here. Make the dressing by using a hand blender or food processor to puree the green garlic, salt, lemon juice, olive oil, avocado, honey, and pepper until smooth. Taste, and adjust with more salt, or honey, or lemon juice. 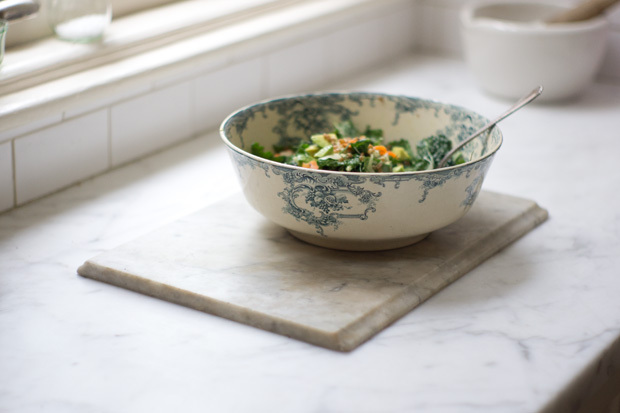 Before you're ready to serve, combine the kale with about half of the dressing in a large bowl use your hands to work the dressing into the kale, softening up the kale a bit in the process. Add the farro, carrots, and fennel, more dressing, and a couple pinches of salt, and toss again. Taste, and add the last of the dressing if needed. This is a salad I like quite heavily dressed. Add the avocados and almonds and give one last gentle toss.